Documenting a year of dedication to a one-acre plot of land, a writer tells the story of homesteading in the suburbs, maintaining and learning from a bee hive, a full-scale vegetable garden, a fish pond, and ducklings. IP. Moffett, an English professor and science fiction author, took a year-long sabbatical to become as self-sufficient as possible on her one-acre yard in suburban Philadelphia. Using a journal format, she chronicles the work involved in establishing her garden, fish pond, beehives, and duck pen. As in a miniature Gaia, all the components, from algae to humans, are interrelated. Moffett frankly acknowledges the forerunners whose homesteading accounts inspired her own experiment (e.g., Helen and Scott Nearing's Living the Good Life, LJ 11/15/70, and Harlan Hubbard's Payne Hollow, LJ 11/1/74) and points out some philosophical differences. 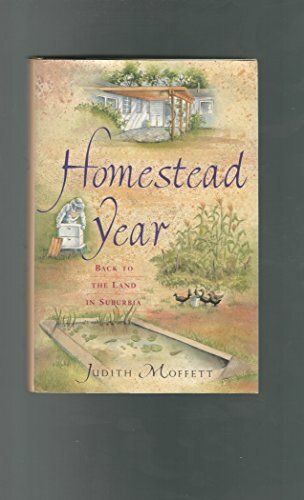 While her meticulous recording of varieties of seeds started makes for slow reading at the beginning of the book, the pace soon picks up, and Moffett's account culminates at year's end with more successes than failures. This is an excellent picture of the tasks and problems facing anyone considering a similar project, told in a very readable manner. A good addition where gardening and homesteading titles are popular. ?Cheryl Childress, Collegiate Sch., Richmond, Va.